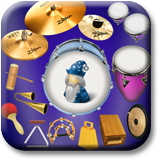 Percussion Drum Wizard - the most comprehensive Percussion and Drum app available! Drum sets & percussion on the go. Become a Latin, Rock, Jazz or Heavy Metal drum set hero! Especially designed for the music lover who wants realistic sounds, animated instruments, and the fastest touch response. Tap or swipe your fingers over 25 unique instruments from wood block, cowbell, bongos, congas, and more. Hear what a guiro or agogo sounds like. Comes with 18 background beats and 5 music tracks. From the makers of the popular Drum Set Kid, Percussion Drum Wizard offers endless musical entertainment for the whole family. Ready to play instantly but comes with lots of options too. Pick your favorite drum color, bass drum logo, animations, and background spotlight colors. 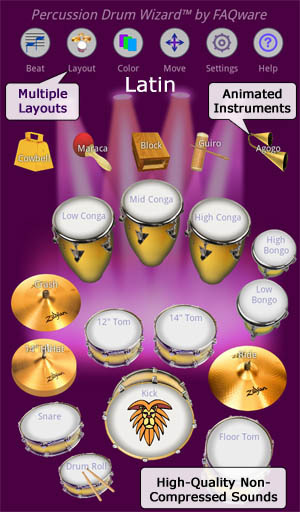 Move instruments and save your custom drum kit layout for the next time you play. Start with the Latin, Rock, Jazz, or Heavy Metal drum set layout to learn how real drummers position their drums & cymbals. Just like a real drummer, simultaneously tap the bass drum & China cymbal or press on the snare drum roll & end it on a rimshot. Turn on the beats or hit the bass drum & watch the spotlights move. Overlap instruments to create new percussion sounds. Tap in the overlap area to play multiple instruments at once. You can still play each instrument with a tap in the non-overlapping area. Want to play super fast? Try twiddling two fingers back & forth or tap between the overlapped instruments. Want help creating a steady beat? Use a background beat or press & hold down on the snare, Hi-Hats or Ride cymbal. To change the tempo, long press on the Beat button & adjust the tempo slider when it appears. Works on smartphones and high-end tablets such as Kindles, Samsungs and Nexus. The current version now works on Kindle device HD and high-end smartphones that have minimum of 512 Mb of RAM, such as Samsung Galaxy S3/4/5. If you have an older version, please get the latest free update.